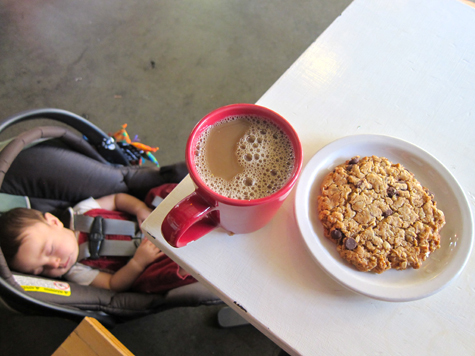 I grabbed a much needed cup of coffee and oatmeal-peanut butter-chocolate chip cookie. Yes, sometimes you NEED a cookie, amiright?! I caught up on my email while Waits snoozed peacefully beside me. Afterwards, we met up with the other vegan babies for a play date. That was a good day. Breakfast is my favorite meal to eat out, which is funny because I usually skip it at home. What can I say? It always seems like so much trouble to fix an elaborate meal in the morning. But I love it when somebody else does it for me! 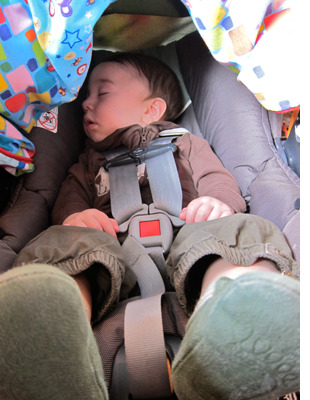 We’ve got this whole system down, where we time it perfectly so that Waits falls asleep on the way to the restaurant and slumbers contentedly through the entire meal. It’s the only way Damian and I get to eat at the same time! It’s almost like a date, and it’s a very precious weekend ritual. Hungry Tiger Too is actually a bar – home of the 1 dollar vegan corn dogs, and their food is sloppy and satisfying. 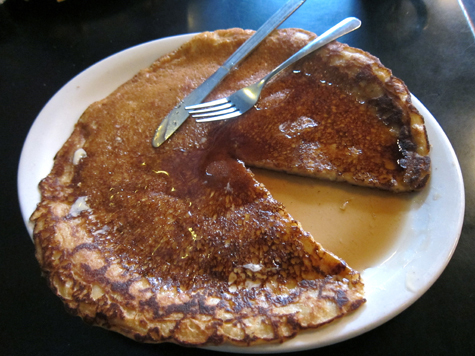 I’m totally in love with their giant pancake (look at the fork for reference), which tastes EXACTLY like I remember McDonalds pancakes tasting. Is that a good thing? Maybe not, but it’s nostalgic and nummy and I can’t get enough! 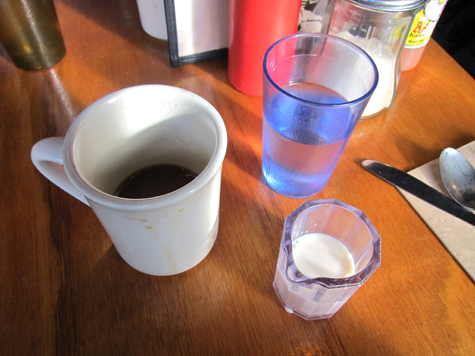 The next weekend I begrudgingly skipped the pancake and we tried breakfast at Vita – a first. Um, Holy. Effing. Hell. 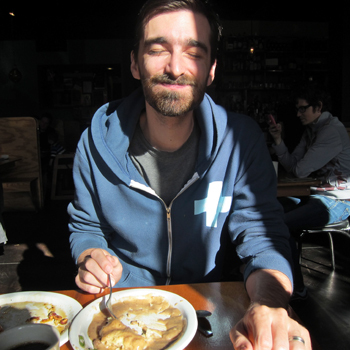 Damian thoroughly enjoyed his biscuits and almond gravy. He also got an amazing toasted hazelnut corn cake. It was pretty epic. 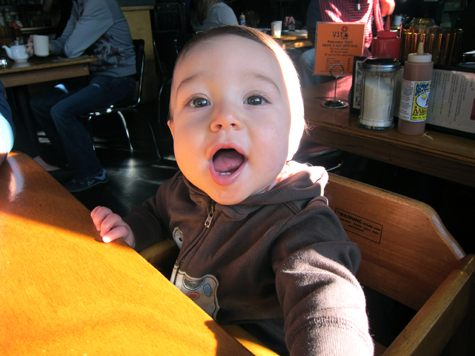 Waits woke up half way through the meal, so we tried him in a high chair – another restaurant first. Success! He had fun banging cups and throwing silverware while we chowed down. 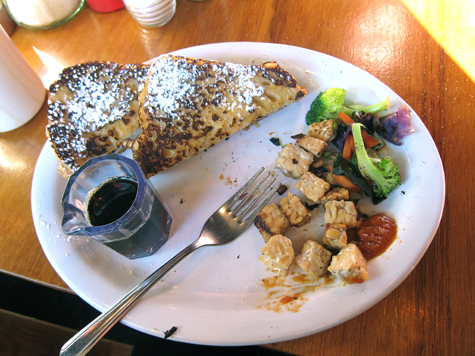 I had a tempeh veggie scramble with french toast. It was divine! Maybe I’m showing off a little. All vegan bakery. I <3 Portland! They also have an amazing ice cream/soft serve/sundae menu, though I’ve never partaken in it myself. I swear I don’t eat all pancakes and cupcakes. 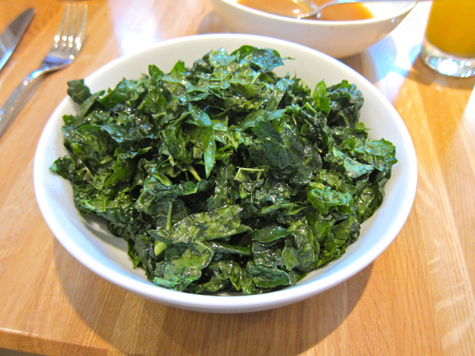 Here, I had a *mountain* of kale and a side of grilled taters, plus tahini dip for both. That’s pretty much my idea of a perfect meal. Too bad I forgot a pic of the actual food! 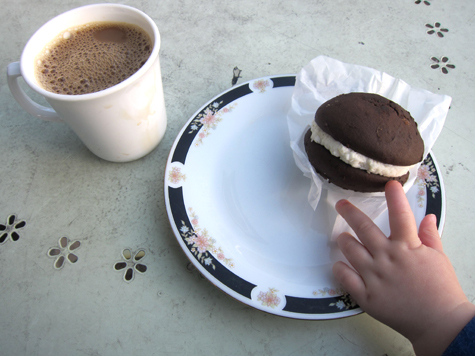 Haha, chubby little paw reaching for mah whoopie pie! I have to say, I totally dislike Stumptown coffee. Don’t kill me! 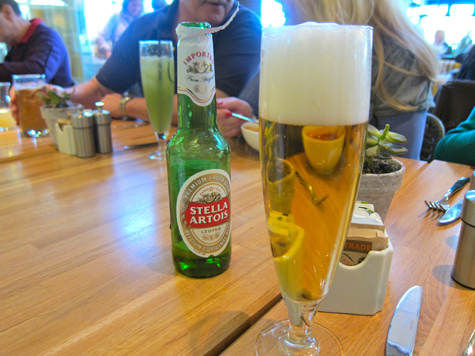 Damian’s Stella. I got a fab coconut water-pineapple concoction. 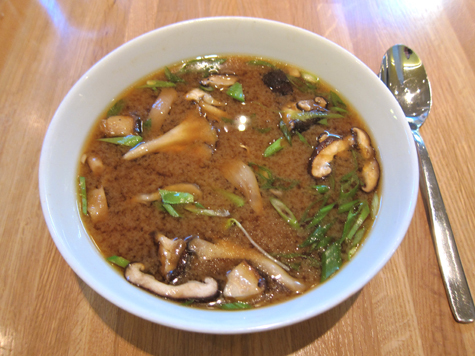 Miso soup with mushrooms. This was pretty stellar – perfectly salty and a nice portion size too. The kale salad, minus the parmesan and croutons . . . which made it just a bowl of dressed kale . . . which was perfectly fine by me! 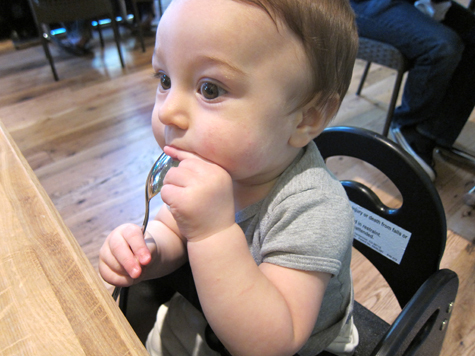 Waits loves to eat silverware. This place was pretty good. It’s a chain I guess, which is cool to see a ‘mall restaurant’ with a healthy theme, that could actually deliver real, organic food. I sure hope this is the future of ‘big box’ restaurants! 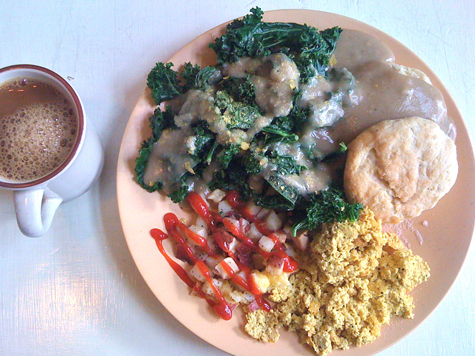 No tour of Portland vegan dining would be complete without the brunch buffet at Sweetpea. Why is it so good? WHY??! 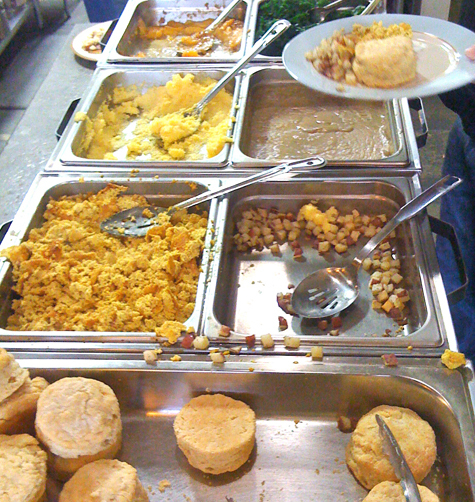 This week featured biscuits with light gravy, home fries, tofu scramble, steamed kale, grits, and peach crisp. I’d pay full price for the biscuits/gravy/kale alone. 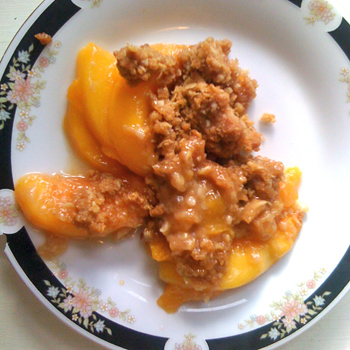 Peach crisp. It was okay, but mine is better. I’ll forgive them. And that’s what a vegan eats, dining out! ARGH I AM SO ENVIOUS! I’m going to move to Portland as soon as possible. I’m not kidding. 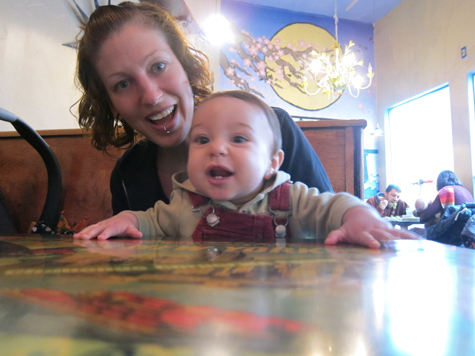 Your kid is totally disproving any idea that vegan kids don’t get enough nutrients – He is so cute and perfectly roly-poly! I always forget you aren’t RAW vegan. Ohhhh I’m so jealous! where I live there are very few vegan options to dine out, and the few that exist, I can’t afford them! But that’s o.k. because I actually prefer to cook my own food (although I wouldn’t mind having one of those cookies and the whoopie pie). I’m impressed with the number of (awesome looking) vegan places in PDX! That pancake looks divine. It’s decided. I’m moving to Portland once I’m done with school. And yes just for the amazing vegan food! Memphis has not even ONE place that looks nearly as incredible as this!!! Your pictures are always AMAZING! I LOVE SEEING WAITS!!!! His eyebrows! His ALWAYS sweet/surprised expressions! OMG I could eat him up! I told the bf I’m gonna be sad if our baby doesn’t smile as much as Waits seems to! Is he always such a happy baby? Certainly looks like it from your pictures! GAH! Oh goodness gracious. 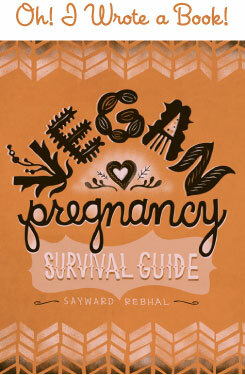 I thought I had tried quite a number of the vegan offerings of Portland, but I’ve only been to SweetPea from this list! Looks like another trip there is in order…if not just for a food tour! um…we are totally jealous of your eating adventures! we get cravings for the reuben from veganopolis!! have you ever eaten at van hanh? SO good! I’ll be back in Oregon in threeeeeee weeeeeeks woooooo! I don’t get the Stumptown dislike though, I’m plannin’ on rolling in to the train station at 10am and heading straight to voodoo doughnuts then stumptown then Saturday Market. Assuming that the Festival of the Last Minute still happens! Vita looks really good! I always mean to eat lots of tasty food when I’m there, but I tend to get a little hermity in my parents house in Gresham. There is an amazing vegan health food cafe in my city, a kind of blink and miss cafe through a door, up an old staircase and into a secret little room with an open kitchen and unmatching decor. They sell all kinds of burgers on amazing sourdough buns and amazing [get a new adjective, Annie!] falafels, soups, wraps and smoothies. Unfortunately, the carboard sign on the door displaying the opening hours reads ‘when I feel like it’, so it’s sort of pot luck going there – You can never really plan a lunch there. i am so glad to see Back to Eden made your list! I had them do whoopie pies for my wedding cake this summer, and it was the best decision we ever made! They even make mini-whoopies if you are ordering them in quantity, super cute! i came to your site for your laundry detergent recipe, and have stayed for your fabulousness in everything else! Hey! Is that the Kathryn I know?! 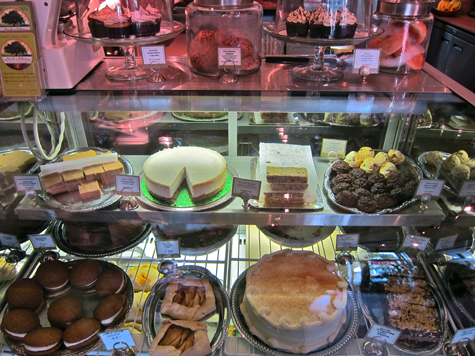 I just showed my husband the pictures of Sweetpea’s brunch buffet and he happily–and with envy–groaned. I love Portland. I miss Portland. 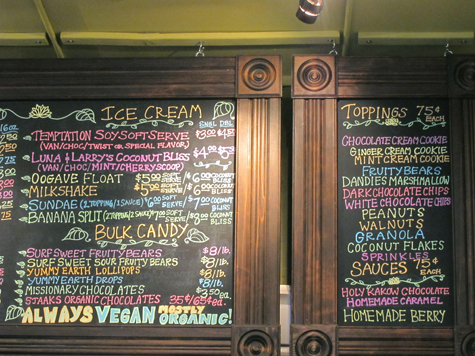 And OMG, another all-vegan bakery? That looks amazing, amazing, amazing.